This is an excerpt from the CBC series "The Days Before Yesterday." 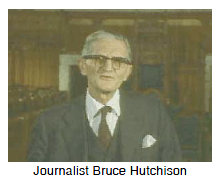 In it, journalist Bruce Hutchison explains quite succinctly the complex series of events known as the King-Byng affair (also called by some - the King-Byng Wing Ding). The King-Byng affair of 1926 was a complicated constitutional maneouver by Prime Minister Mackenzie King which involved the Governor General, Julian Byng. Byng had been the British general in charge of the Canadians at Vimy Ridge during the First World War. During the twenties he was sent over by Britain to be the Governor General: the representative of the monarch (crown), appointed on the advice of the Prime Minister for a term of five years.Governor General of Canada. When scandal and a vote of non-confidence threatened King's minority government: The governing party has less than half the seats in parliament. If the opposition parties voted together, they could defeat the government.minority government early in its term, King wanted to dissolve the government and call another election, but the Governor General, operating within his constitutional rights, denied King's request. King resigned over the issue, and Byng called on the opposition leader, Arthur Meighan, to form a government. This government lasted only three days, however, before it lost a vote in the House of Commons and an election had to be called after all. King took advantage of the situation to argue that he, the elected Prime Minister of Canada, had been overruled by the representative of the Crown. Britain was interfering in the affairs of a sovereign: having independent, supreme authority; not controlled by others; selfgoverning.sovereign country. During the election campaign, King focussed on this constitutional issue, managing successfully to divert public attention from the Customs Scandal that originally gave rise to the problem and was a blot on his government's reputation. By recognizing the spirit of nationalism: the desire of a people to preserve its own language, religion, traditions, etc. often within an independent national state.nationalism and independence in the country and being a spokesman for it, King won the next and several subsequent elections.